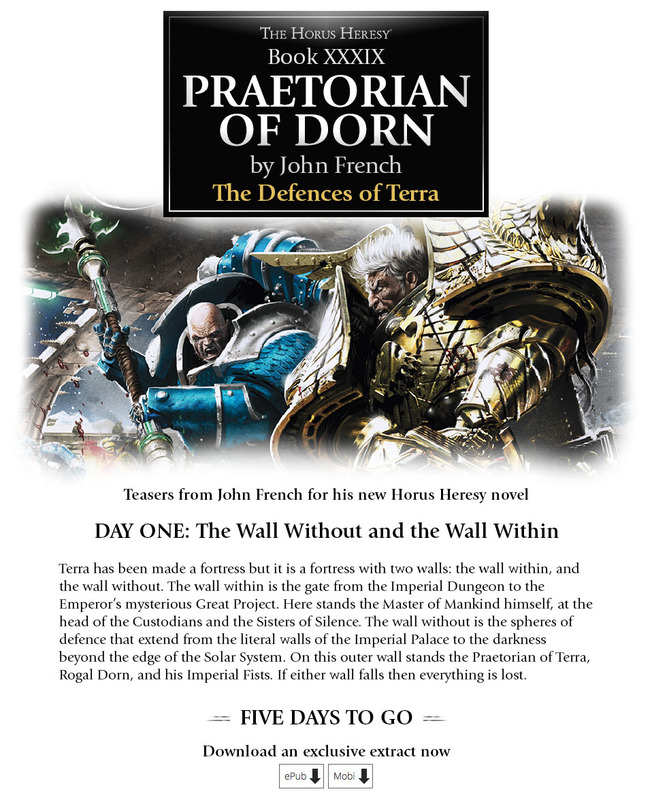 Horus Heresy Book 37, Praetorian of Dorn by John French, now has a confirmed release date of August 27th. So in three weeks we'll be able to pre-order the newest Horus Heresy novel with Dorn vs Alpharius all over the cover. If you happen to be in the Nottingham area on the 19th around 4pm-7pm, you can drop into Warhammer World for free and pick up an early release copy, and get it signed by John himself. So i'm super-freaking jealous as it would cost me £100 to get to Nottingham, so obviously I won't be taking advantage of this... anyone here lucky enough to be capable of going? Looks like it will be out -THIS- weekend! Saw this earlier, The Wall Without sounds absolutely awesome! Can't wait to see how Terra is defended on both physical and psychic fronts. Not according to the info we have on John French's signing of the book this Friday. The book will be available there on early release and then go up for pre-order on the 27th. Why else would the advert say five says to go if not out this week? newest Horus Heresy novel with Dorn vs Alpharius all over the cover. Or is it? Is that really Alpharius? So I think your dates was wrong, LoTN. Huh, weird. Then the early release is only by a single day. What's the point of that? Look at the weapon, that is the Pale Spear. Alpharius's own weapon. I think that's really him, for maybe the first time ever that is really the First Head of the Hydra. Could possibly be ebook only the first week. That sounds plausible to me. Finished Praetorian of Dorn...... Unbelievably complex. So many plot strands woven together and comming to a screaming peak at the finale of the book. This is what the Heresy has been waiting for. I give it a 10/10. The Horus Heresy has been revitalized and kicked into high gear again, the plot thunderously pushing forward after languishing for so many years with filler stories about the Shattered Legions or Calth/Imperium Secundus. I will say this much, theres an epic and unbelievable death that noone saw comming that will have serious ramifications. Last edited by Brother Lucian; 08-20-16 at 03:40 PM.